Want to get in on the ground floor of a promising artist’s career? Visit an art school graduate thesis show. Boston-area art schools have been foundational for major artists from Lois Mailou Jones to Joan Jonas to Christian Marclay. 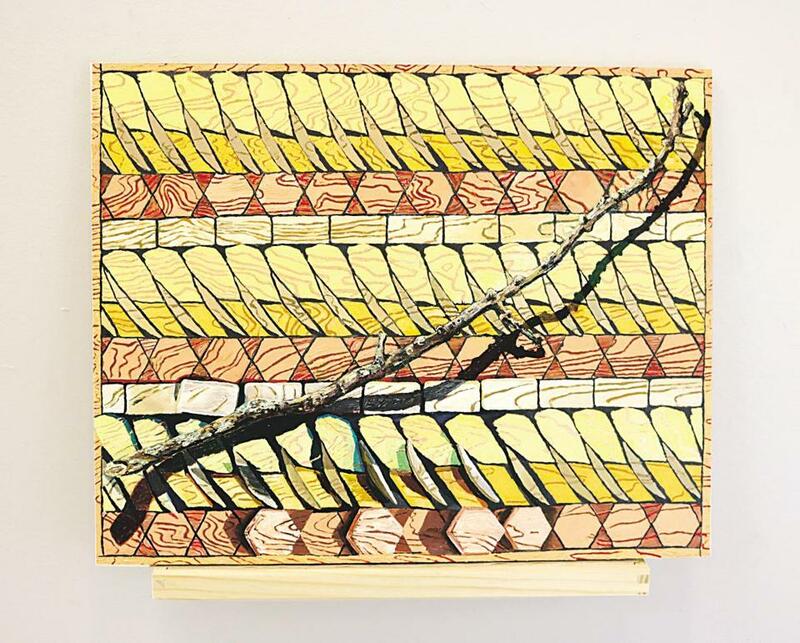 We met with some up-and-comers who are exhibiting work this spring at Boston University, Lesley University College of Art + Design, Massachusetts College of Art and Design, and the School of the Museum of Fine Arts at Tufts University. 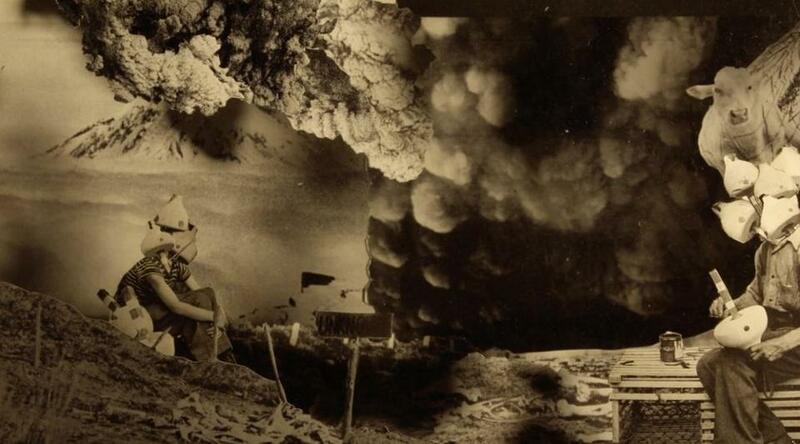 Last summer, while visiting the Massachusetts Museum of Contemporary Art, Morrison found herself watching people absorbed in Laurie Anderson’s virtual reality art. “I was completely locked out of their experience,” Morrison says. Their minds were elsewhere, yet their bodies were present, moving, and oblivious to others. Morrison, who previously made videos of onlookers at public events, had found the subject of her thesis show. 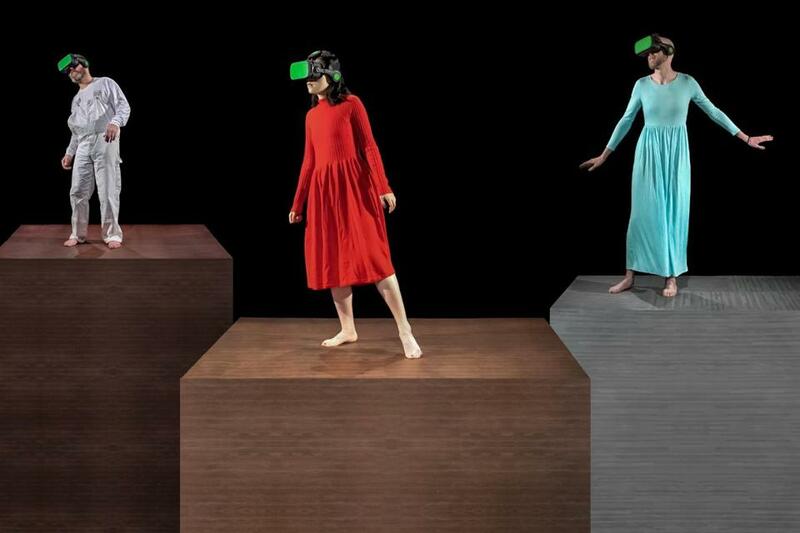 In the darkly comic multi-channel installation “12 Players,” viewers encounter life-size projections of VR players in monochrome uniforms and headsets. They duck and weave, dance and gawk, enacting a private experience in public. Morrison edits the work into choreography, rhyming gestures. The players somehow recall Vladimir and Estragon in “Waiting for Godot” — stripped of agency, trapped in time. Like our smartphones, virtual reality yanks us into disembodied worlds. Morrison reminds us of the bodies we’ve left behind. Schmitting’s subjects are simple — consumer goods, scraps of wood — but their worlds wobble dizzily from one painterly reality to another: realism to abstraction, illusion to — shall we call it disillusion? “Remembrance” features a ribbon, a torn valentine, and a background that plays with thick pigment, bare wood, geometry, and overlap. The eye darts from picture to texture to riddles of juncture and form. 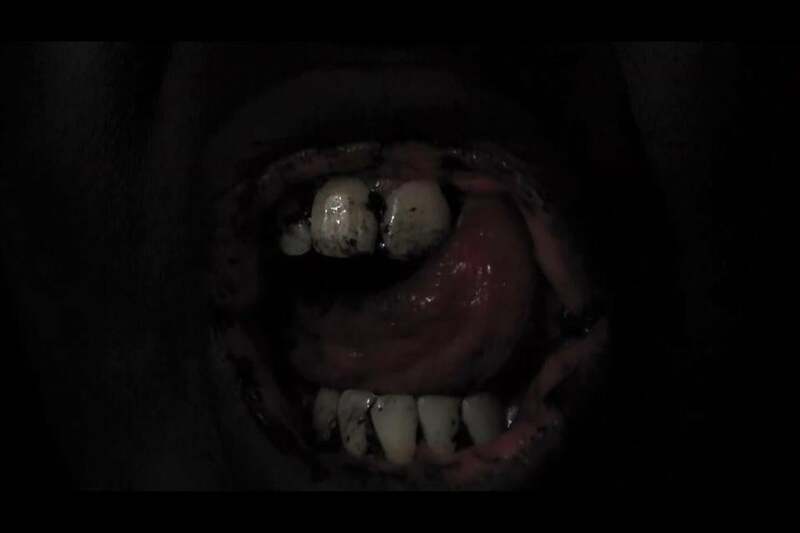 Close-ups of the artist’s mouth appear in several videos in a darkened space. Her skin is painted black, her teeth speckled with charcoal. But not, she insists, as a racial signifier. In each video, Coleman weaves memories and music. “I lay things over each other until the original narration is obscured,” she says. The videos confront and mesmerize — the whispering, murmuring, and singing mouths cannot be escaped. One video interleaves four stories. “Mickey Mouse and his friends were all my saints when I was little,” says Nieto, who grew up Catholic in Arizona. Her parents are Mexican; Mexico’s patron saint, Our Lady of Guadalupe, also loomed large. Nieto’s wry and playful lenticular photos and installation pieces examine the mystical power of childhood beliefs, find links between faith and magical thinking, and blend pop culture and religious ritual. 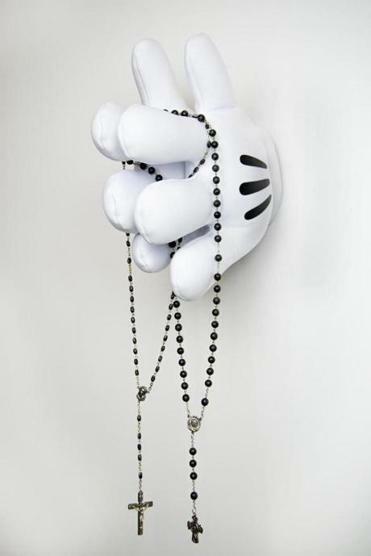 An installation piece, “Rezando con Mickey” features rosaries strung over iconic white gloves. Elsewhere, the artist adds a Disney soundtrack to a 1940s found film clip, of a family attending church. In all the pieces, Nieto contends with her own evolving beliefs, picturing herself as the Virgin of Guadalupe in a lenticular print, and revisiting her adolescent reliance on a Magic Eight Ball for answers to crucial questions. “I don’t feel like an outcast from the faith,” Nieto says, but neither does she share her family’s reliance on it. “Same God, different address,” she says. Barnes’s sound installation is in a blacked-out space lined with hair extensions: eerie and tactile. A woman’s voice instructs the listener to be sad; then she giggles. She hyperventilates, and then invites the listener to breathe deeply. It’s intensely unnerving. Barnes traveled to Kenya to study the use of hair extensions there. The ones in her work are freighted, conjuring up conflicting notions of black femininity and power, along with the sheer creepiness of stray hair. The artist also makes animations, using photo clippings and artful sound design, pointedly evoking suspense. The installation, with its immersion in darkness and alternately soothing and anxiety-provoking audio, is suspenseful, too: a trap, a ruse. “People don’t want to acknowledge or deal with the pain black people go through,” Barnes says. Shiner’s comic thesis projects skewer American and art-world exceptionalism. In one, Shiner plays know-nothing tour guide Kevin West. 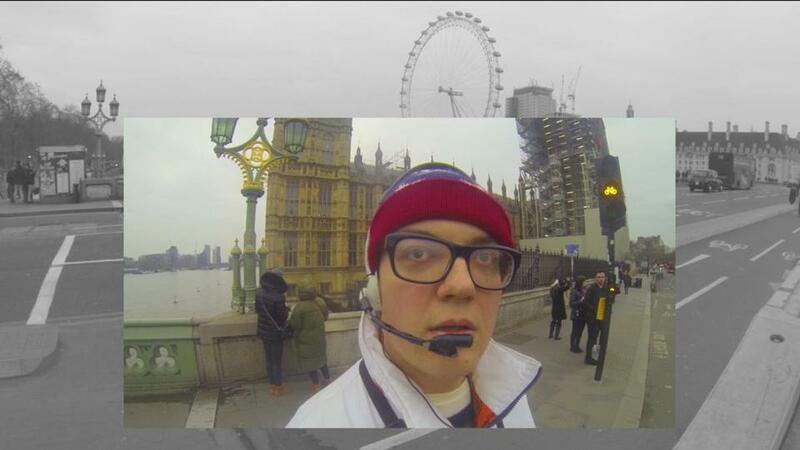 Kevin West appears in videos giving tours through Europe, and Shiner will perform live during the thesis show. For his second piece, Shiner e-mailed dozens of artists inviting them to send him their work for free, to use in a collage. The piece critiques appropriation, value, and credit in the art world, where one person often gets credit when many hands have made the work. Guerilla Girls, Lyle Ashton Harris, and others have sent art. Many have not responded to Shiner’s e-mail. “It’s a satire where I’m playing the villain,” Shiner says. “I’m perpetrating the crime again,” that is, using others’ work without proper credit.